MB&F is known for their unconventional creations. Their timepieces are known as horological machines, and they take a completely non-classical approach to displaying time. Their pieces can be confusing at first glance, but once you understand them, they are remarkably easy to read. I would say even ‘instinctive.’ They do not display time the way we have been taught to read it, but their displays are bold and they are internally logical. Once you’ve been shown how to read them, they leap out at you. That last sentence is a particularly rough introduction to their new machine, Horological Machine No. 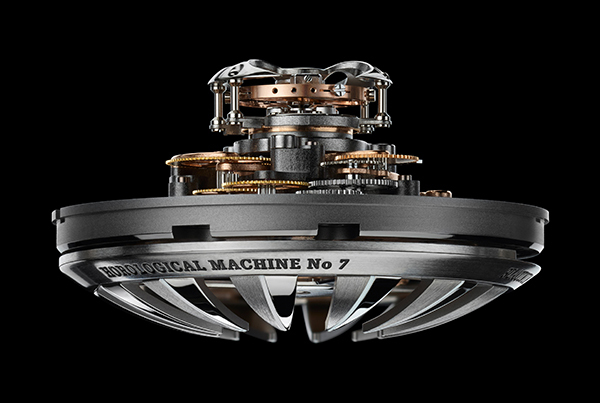 7, also known as HM 7, but known in-house as the MB&F Aquapod. The Aquapod takes its design from a jellyfish. The watch itself forms the body; the strap, hanging down, forms the tentacles. In a sense, it’s gripping. (Sorry. Couldn’t resist.) And, like many jellyfish, the Aquapod glows in the dark. It glows quite strongly, actually, it’s rather a lovely sight. All the display rings and the tourbillon suddenly light up with a deep blue radiance. You read the Aquapod thusly: a prominent blue marker at the bottom of the dial tells you all you need to know. The rotating hour ring is the closest to you; at a glance, you can see what hour it is (the numeral to the left of the blue line) and roughly how far along in that hour we are. Just above that is the rotating minutes ring, even more detailed and easy to read. The tourbillon on the top marks the seconds as they pass. 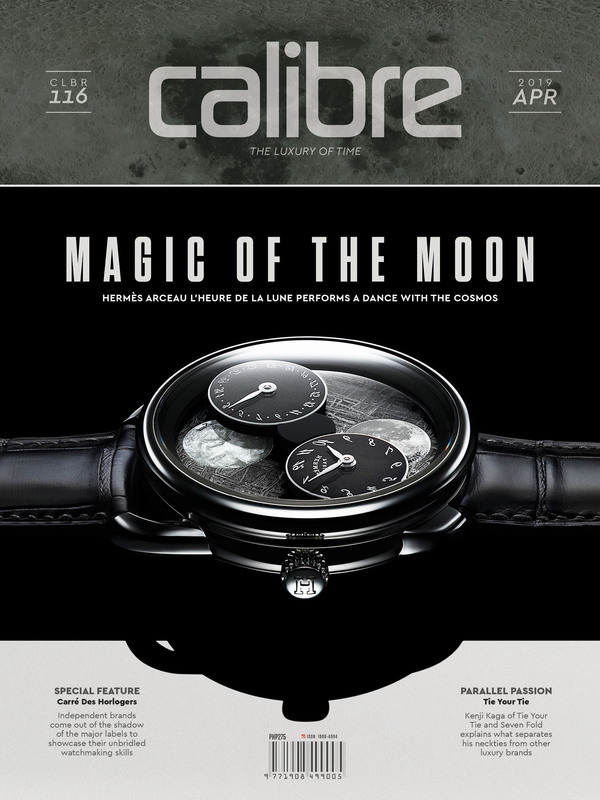 There are two versions of the HM7, one in grade 5 titanium with a blue bezel, and one in red gold with a black bezel. Power reserve is 72 hours. There are two crowns, one on either side of the case. One is for winding and the other is to set the time. MB&F is always breaking new ground, but the HM7 is really unlike anything they’ve ever done before. Most watches have flat designs, striving to be relatively thin. The Aquapod is a top-down design, and her inner workings all radiate outward and downward from the top center. At that top of the watch is a rotating tourbillon. Everything else moves outward from that center, like ripples in a pond. The HM7 was inspired by a jellyfish, from an encounter that Maximilian Büsser had with one on a beach when he was a child. The Aquapod imitates the jellyfish in more ways than one. Like a jellyfish, the timepiece is radially symmetrical. 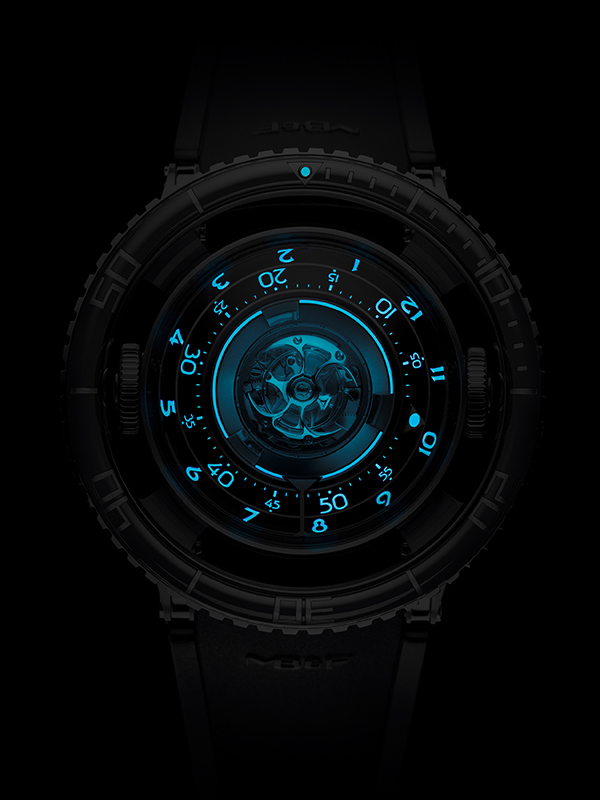 Most watches have a left or right orientation, but the HM7 has displays in concentric circles. Both hours and minutes have their own display rings, and the view from above the watch shows the seconds on the 60-second tourbillon, surrounded by the ring of the minutes display, which is in turn surrounded by the ring of the hours display. These displays are not flat, nor angled. Instead, they are precisely curved spherical segments. They had to be matched to the sapphire crystal hemispheres so that maximum visibility could be achieved. Even more significantly, the Aquapod has a distinctive up-and-down orientation. All the movement components are arranged vertically, not on a flat plane. (Surprisingly, this concept did not originate with MB&F. Apparently, there were three-dimensional spherical-movement “onion” pocket watches back in the 18th Century.) Although the idea is therefore centuries old, the HM7 movement had to be designed entirely in-house by MB&F. 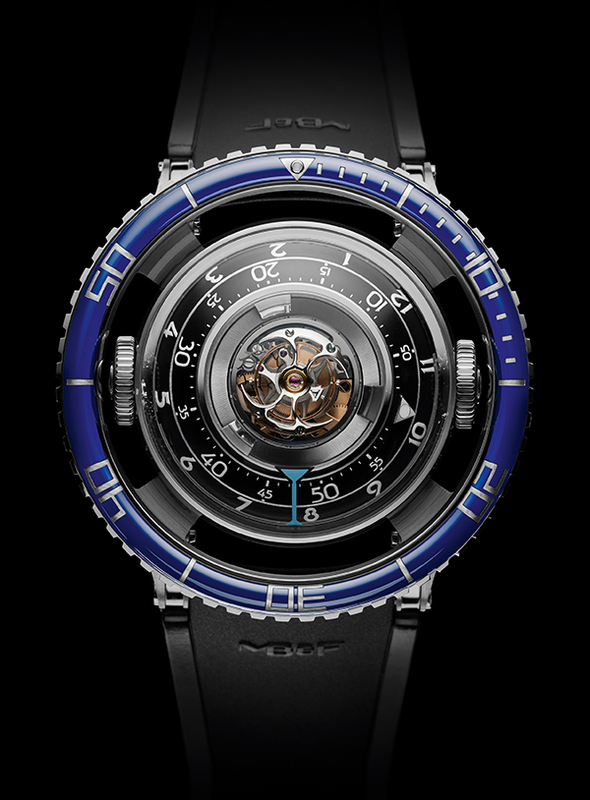 From bottom to top, the winding rotor, the mainspring barrel, the hour ring and minute ring, and the flying tourbillon, are all concentrically mounted around the central axis. This meant that the energy of the watch had to travel from the winding rotor all the way up to the tourbillon at the top. This was done using a series of gears, letting the power travel up from one level to the next like it was climbing a staircase. The case is actually two high-domed hemispheres of sapphire crystal, fused in the center around a metal case band. One unmistakable feature of the Aquapod is the ceramic bezel, in blue or black, that sits OUTSIDE this central band. The decision was made to make this a unidirectional rotating bezel, the same type that is found in all dive watches. 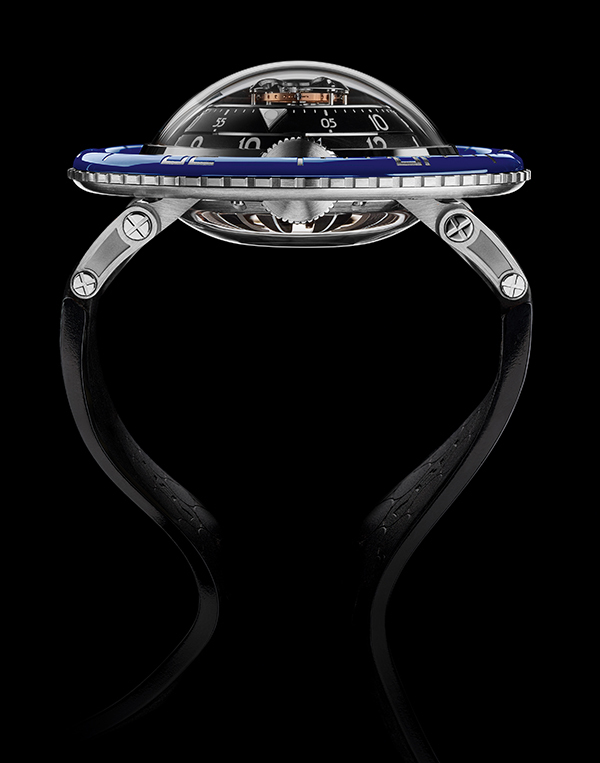 Although the Aquapod is by no means a dive watch, MB&F wanted to include this touch as a nod to her waterborne nature. The ceramic bezel is beautifully done, and it wasn’t easy. Every numeral on the bezel had to be hand-painted, because there was simply no way to print on such unusually curved components. 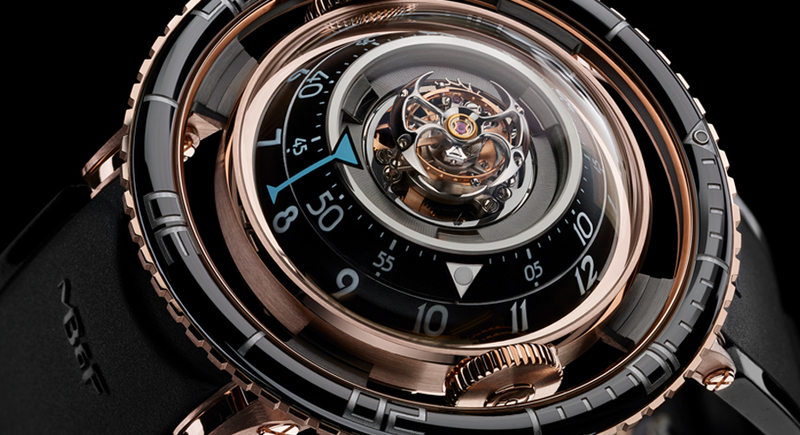 The rotating cage that sits atop the display and visually holds it all together is a flying tourbillon. 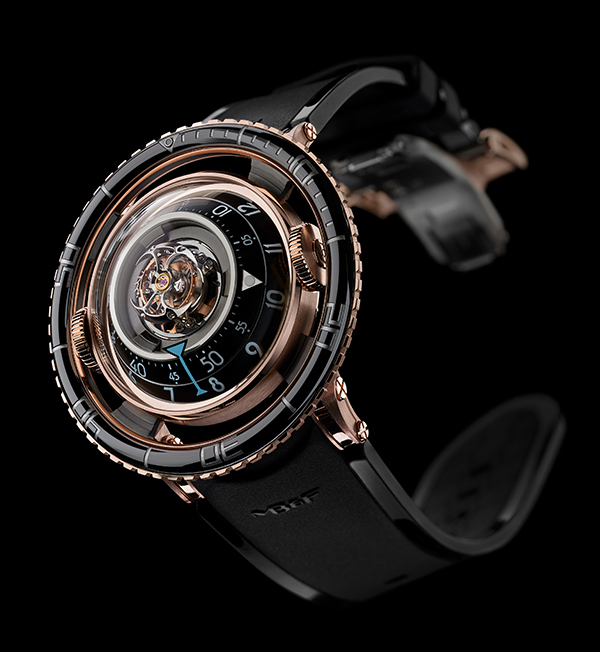 A standard tourbillon would have required a bridge, and that would have affected the visibility of the display rings, so MB&F made this choice instead. On the underside of the HM7 is the teeth-like winding rotor, which was another challenge to make. The winding rotor looks both organic and disturbing, and those teeth have finishes that alternate between polished and satin-finished sections. The teeth are lightweight titanium; ironically, hidden away beneath them is another section in platinum, which is much heavier. The weight is needed for the winding rotor to properly function. The vertical construction of the Aquapod is more than distinctive: it influenced its entire design and creation, and the execution of the plans. Indeed, the creation of the Aquapod proved to be extremely challenging. 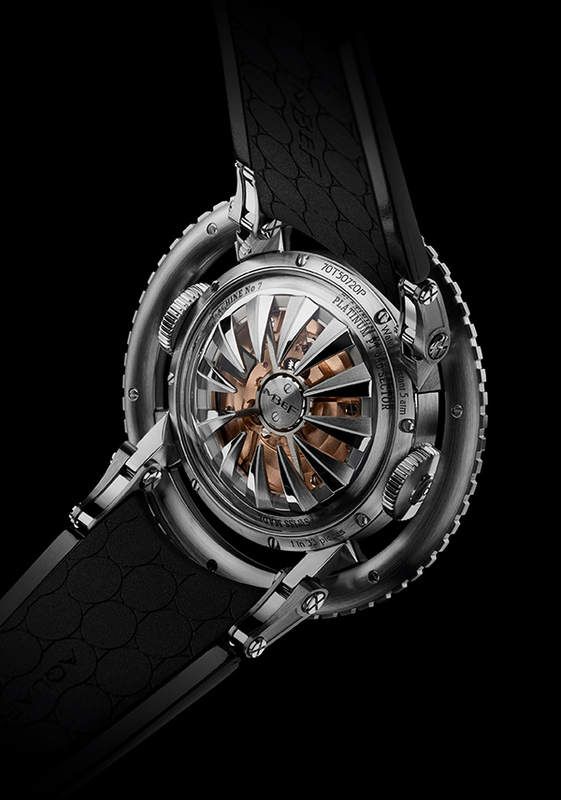 Designing a timepiece that was radially symmetrical and whose displays radiated outward from the center was one. Formulating a movement assembly that was downward instead of outwards was another. It was so difficult to get the HM7 Aquapod into production that the MB&F HM8 actually came out first. MB&F is always breaking new ground, but the HM7 is really unlike anything they’ve ever done before. Some of the challenges the design team faced are not so obvious. Those rotating hours and minutes displays are relatively large. Indeed they are far bigger than any conventional rotating display. (Consider if you will that the standard subdial is a size that fits comfortably on the side of the dial, whereas the Aquapod’s rotating displays basically have to go around the whole watch.) MB&F’s answer was to develop extra-large ceramic ball bearings for extra support and minimum friction. (There’s a joke in there, but I’m not going to make it.) The hours and minutes displays are spherical discs, made of aluminum and titanium to increase rigidity and reduce mass. Contrast that with the winding rotor, where they actually had to use platinum to ADD weight for the rotor to do the work that a self-winding movement needs to do in order to wind the watch. The Aquapod is a new form of Horological Machine. In some way it is as different from MB&F’s other work as men are from jellyfish. But the forms of both contain life, and that is reason enough to celebrate it. In time, we may come to value and respect our seaborne fellow creatures despite our differences, and so too may the Aquapod float to the top of our timekeeping lists. Roll on, thou great and majestic ocean, roll on.